SWTBot is a no-hassle testing tool for Eclipse apps and easy to use for your entire team. Thanks to SWTBot's clear-cut approach to testing, novices and power users alike will enjoy using it. And if you haven't moved to SWTBot yet, now is the time. SWTBot can integrate very well within the IDE and testing frameworks like JUnit on Java, or Cucumber on JRuby making it very suitable for writing tests using a scripting language. SWTBot provides APIs that are simple to read and write. The APIs also hide the complexities involved with SWT and Eclipse. This makes it suitable for UI/functional testing by everyone, not just developers. SWTBot also provides its own set of assertions that are useful for SWT. You can also use your own assertion framework with SWTBot. SWTBot can record and playback tests and integrates with Eclipse, and also provides for ant tasks so that you can run your builds from within CruiseControl or any other CI tool that you use. 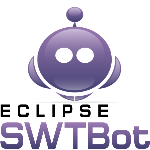 SWTBot can run on all platforms that SWT runs on.